"Report: Trump administration considers Texas sites for tent cities for immigrant children" was first published by The Texas Tribune, a nonprofit, nonpartisan media organization that informs Texans — and engages with them — about public policy, politics, government and statewide issues. Editor's note: This story has been updated with comment from the U.S. Department of Health and Human Services. Texas may soon be the site of tent cities that will house immigrant children separated from their parents as a result of the Trump administration's "zero tolerance" policy, McClatchy reported Tuesday. The U.S. Department of Health and Human Services is eyeing Fort Bliss, an Army base close to El Paso, as a potential location for a cluster of temporary shelters that could house between 1,000 and 5,000 children, McClatchy reported. The department is also considering Dyess Air Force Base in Abilene and Goodfellow Air Force Base in San Angelo. Thousands of immigrant children have been separated from their parents in the wake of the new policy, which U.S. Attorney General Jeff Sessions announced in April. The policy requires immigration authorities to prosecute adults who enter the country illegally seeking asylum, while children are placed in shelters or with families. The tent city proposal is the Department of Health and Human Services' latest idea for housing the growing number of children under their care, who are quickly filling shelters. A department spokesperson confirmed the report Wednesday and added that it is working with the U.S. Department of Defense to tour the sites and determine whether they are "suitable and selected for unaccompanied alien children program operations." U.S. Rep. Beto O'Rourke, a Democrat who represents Fort Bliss, said Tuesday afternoon he had not received confirmation of the reports. “We have nothing confirmed about where or if military bases will be used for certain," he said. "But, I first and foremost am opposed to this policy of family separation." O'Rourke, who is running for the U.S. Senate, is a member of the House Armed Services Committee, which oversees military policy. Six Democratic state lawmakers from the El Paso area sent a letter Tuesday to Secretary of Homeland Security Kirstjen M. Nielsen and Scott Lloyd, director of the Department of Health and Human Services' Office of Refugee Resettlement, raising concerns about the tent city idea. "The clear purpose of military bases is for armed services operations and housing of military personnel, not for housing immigrant children forcibly taken from their parents," the letter reads. The lawmakers — state Sen. José Rodríguez and state Reps. Joe Pickett, Mary González, Joe Moody, César Blanco and Evelina Ortega — particularly expressed worry that a temporary shelter at a military base could resemble a detention center, which could harm the children's mental health. Earlier on Tuesday, the lawmakers gathered at the federal courthouse in the border city to decry the pending move and urged the Department of Homeland Security to reconsider its policies. "Military bases should be used for armed services — I know [because] I served there," said Blanco, a Navy veteran who trained at Fort Bliss. "We're concerned that temporary ORR shelters at military bases may resemble baby jails and detention centers." Moody and González said they would do whatever was in their power as state lawmakers to make sure that the facility at Fort Bliss is adhering to current regulations that address child detention. "Anytime that you're housing children, your main concern has to be how are they being cared for, are you tending to the medical needs, their emotional needs," Moody said. "And so, if we're going to take that task on, is a military installation the best environment for that?" When reminded that the Department of Homeland Security under President Barack Obama housed immigrant children at Lackland Airforce Base in San Antonio, Moody said he felt the same way then. "It wouldn't change my opinion one way or the other," he said. Report: Trump administration considers Texas sites for tent cities for immigrant children By Claire Parker and Julián Aguilar June 12, 2018 Editor's note: This story has been updated with comment from the U.S. Department of Health and Human Services. Texas may soon be the site of tent cities that will house immigrant children separated from their parents as a result of the Trump administration's "zero tolerance" policy, McClatchy reported Tuesday. The U.S. Department of Health and Human Services is eyeing Fort Bliss, an Army base close to El Paso, as a potential location for a cluster of temporary shelters that could house between 1,000 and 5,000 children, McClatchy reported. The department is also considering Dyess Air Force Base in Abilene and Goodfellow Air Force Base in San Angelo. Thousands of immigrant children have been separated from their parents in the wake of the new policy, which U.S. Attorney General Jeff Sessions announced in April. The policy requires immigration authorities to prosecute adults who enter the country illegally seeking asylum, while children are placed in shelters or with families. The tent city proposal is the Department of Health and Human Services' latest idea for housing the growing number of children under their care, who are quickly filling shelters. A department spokesperson confirmed the report Wednesday and added that it is working with the U.S. Department of Defense to tour the sites and determine whether they are "suitable and selected for unaccompanied alien children program operations." U.S. Rep. Beto O'Rourke, a Democrat who represents Fort Bliss, said Tuesday afternoon he had not received confirmation of the reports. “We have nothing confirmed about where or if military bases will be used for certain," he said. "But, I first and foremost am opposed to this policy of family separation." “This is absolutely the wrong thing for our country to be doing, and I would hate to see us continue this," he added. "The prospect of building tents or using resources at military installations is just wrong.” O'Rourke, who is running for the U.S. Senate, is a member of the House Armed Services Committee, which oversees military policy. Six Democratic state lawmakers from the El Paso area sent a letter Tuesday to Secretary of Homeland Security Kirstjen M. Nielsen and Scott Lloyd, director of the Department of Health and Human Services' Office of Refugee Resettlement, raising concerns about the tent city idea. "The clear purpose of military bases is for armed services operations and housing of military personnel, not for housing immigrant children forcibly taken from their parents," the letter reads. The lawmakers — state Sen. José Rodríguez and state Reps. Joe Pickett, Mary González, Joe Moody, César Blanco and Evelina Ortega — particularly expressed worry that a temporary shelter at a military base could resemble a detention center, which could harm the children's mental health. 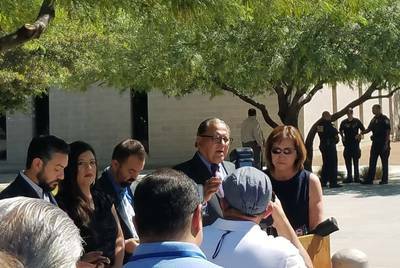 El Paso area state lawmakers (left to right) Reps. César Blanco, Mary González, Joe Moody, Sen. José Rodríguez and Rep. Evelina Ortega hold a press conference stating their opposition to federal consideration of Ft. Bliss as a place to house immigrant children, on Tuesday, June 12, 2018. Julián Aguilar/The Texas Tribune Earlier on Tuesday, the lawmakers gathered at the federal courthouse in the border city to decry the pending move and urged the Department of Homeland Security to reconsider its policies. "Military bases should be used for armed services — I know [because] I served there," said Blanco, a Navy veteran who trained at Fort Bliss. "We're concerned that temporary ORR shelters at military bases may resemble baby jails and detention centers." Moody and González said they would do whatever was in their power as state lawmakers to make sure that the facility at Fort Bliss is adhering to current regulations that address child detention. "Anytime that you're housing children, your main concern has to be how are they being cared for, are you tending to the medical needs, their emotional needs," Moody said. "And so, if we're going to take that task on, is a military installation the best environment for that?" When reminded that the Department of Homeland Security under President Barack Obama housed immigrant children at Lackland Airforce Base in San Antonio, Moody said he felt the same way then. "It wouldn't change my opinion one way or the other," he said. Read related Tribune coverage Federal government tells border prosecutors to adopt "zero-tolerance" policy on immigration ‘They just took them?’ Frantic parents separated from their kids fill courts on the border Texas-based attorneys push to end separation of families who enter U.S. illegally "Report: Trump administration considers Texas sites for tent cities for immigrant children" was first published at by The Texas Tribune, a nonprofit, nonpartisan media organization that informs Texans — and engages with them — about public policy, politics, government and statewide issues. Link back to the original article, which is located at https://www.texastribune.org/2018/06/12/trump-texas-tent-cities-immigrant-children/.